With a flavorful combination of garlic and rosemary, this simple but effective recipe for lamb chops won’t overshadow the decadent taste of the lamb. Fill half of your plate with the green beans and you’ll be stuffed for a very low amount of calories. Boil water in a pot. Add green beans and blanch, 3 minutes. Drain, then immediately put green beans in a bowl of ice water. Set aside. Heat 1 tsp oil in a large nonstick skillet. Add 1 Tbsp of chopped garlic and sauté for no more than 1 minute. 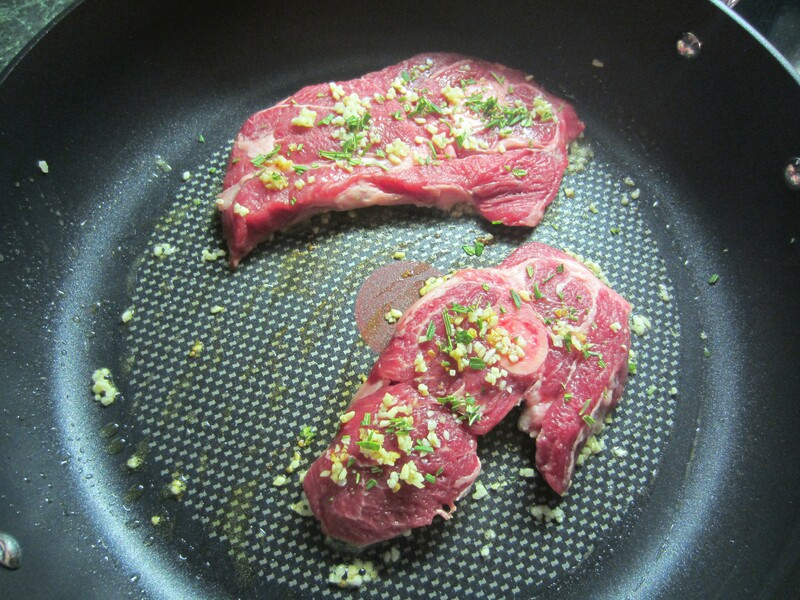 Put a good-sized pinch of rosemary in pan on a gathered amount of garlic and drop a lamb chop directly on it. Repeat with the next lamb chop. Then divide the rest of the garlic not covered by a chop and put on top of the chops. Sprinkle all but a pinch of rosemary on top of the chops. Cook lamb chops 3 minutes, then flip and cook another 3 minutes, or until internal temperature reaches 130 degrees. Put chops on a plate, tent with foil, then set aside. Add remaining 1 tsp of oil to skillet, along with the shallot and remaining garlic. Sauté for about 1 minute. Add the last pinch of rosemary. Drain the green beans and add to the skillet, stirring occasionally for about 4 minutes or until beans reach desired temperature. Serve alongside lamb chops. Jenny Craig: You probably want to add 2 Starch, such as a roll, piece of bread, or a baked potato. The carbs in the nutritional info come from the green beans, so they don’t count towards your starch. I love garlic. And I mean, really love garlic. So I used a lot of it in this dish. Good thing my husband likes it too, or I’d be in trouble. Yay garlic breath. To cut down on prep time, I used pre-chopped garlic from a jar, which isn’t quite as good as fresh garlic, but in many cases is worth saving the time to peel and chop the cloves by hand. If you’re not quite as obsessed with this zippy vegetable as I am, you can use less and the recipe will still work. But I wouldn’t skip it all together. 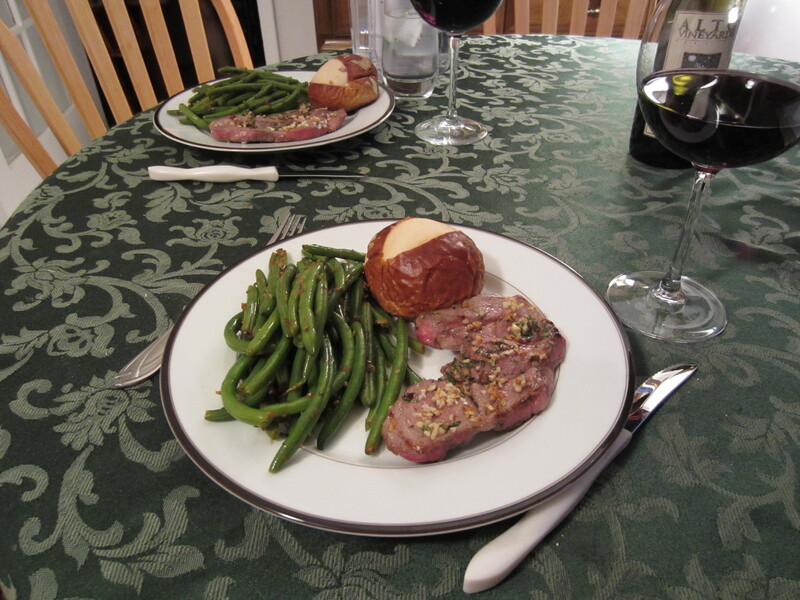 The garlic/rosemary combination really enhances the lamb flavors. And don’t forget – garlic is an allium vegetable and can really lower the risk of cancer and heart disease. So delicious and medicinal. In my family, lamb is usually served with mint sauce or mint jelly. Since mint sauce is 5 calories per tsp, it’s considered a free dietary exchange. So use it freely. But mint jelly runs around 60 calories per Tbsp and doesn’t go nearly as far. Just an FYI. The wine in the picture, in case you’re curious, is a 5oz pour. 5 fluid ounces of wine usually comes to 125 calories. It’s a small splurge, and having one glass won’t cause you to gain weight. But I highly recommend measuring it out first in a measuring cup. It feels weird, but then you can feel confident that you know what you’re drinking and you’re not just guessing. I didn’t include the pretzel bun from the featured image in the nutrition info, but it’s important to add a starch serving to your meal for good nutritional balance. You want a starch that’s between 160 to 200 calories, and has 30g of carbs. That’ll equate to 2 Starch. I used lamb arm chops because they’re a relatively inexpensive cut of meat. I think I paid $5 for both chops. So lamb doesn’t need to break the bank. You just need to find it, pan fry it, and guiltlessly enjoy. Great post. Lamb is one of my favorite foods but I never think about making it at home.